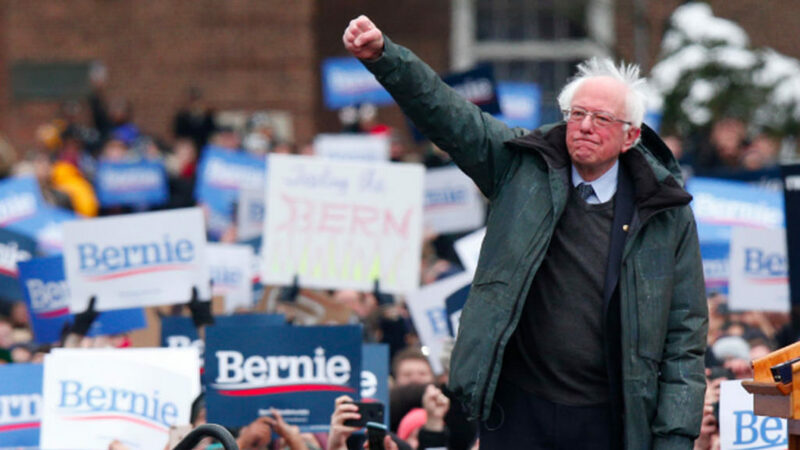 NARRATOR: Today in Brooklyn, New York, Bernie Sanders held his first campaign rally since announcing his intention to run for president in the 2020 election. BERNIE SANDERS: The principles of our government will be based on justice. On economic justice. On social justice. On racial justice. On environmental justice. NARRATOR: Before he spoke, we asked his supporters if they had feedback for him–what he should do that is different from the 2016 elections. What are people interested in hearing more of, and how does he win over more voters than he did in the last election? BERNIE SANDERS SUPPORTER: Sick to your core values and try to reach out to the middle. BERNIE SANDERS SUPPORTER: Reaching out to communities, people of color. BERNIE SANDERS SUPPORTER: Appeal to the students. BERNIE SANDERS SUPPORTER: Get away from the whole idea he’s, like, a socialist, because I think people think sometimes it’s like, you know, the China thing going on. BERNIE SANDERS SUPPORTER: And no one has ever mentioned helping the homeless and building more affordable housing, and that seems to be an issue. BERNIE SANDERS SUPPORTER: Bernie needs to address reparations in a way that no other candidate is doing. BERNIE SANDERS SUPPORTER: In order to get more support he does have to do more outreach to communities of color. BERNIE SANDERS SUPPORTER: I think he’s going ahead and he’s tying the fight against economic inequality and the fight against the 1 percent, so to speak, from all the way back in Occupy and all that stuff, and putting it in a foreign policy schematic. So it’s not just like an American fight, or a British fight, or a Russian fight, or what have you. It’s a global fight against the kleptocracy and against, you know, a set of oligarchic figures that sort of exist beyond the law. NARRATOR: Judging from their answers, it seemed as if his core audience was getting exactly what they wanted. BERNIE SANDERS SUPPORTER: Our narrative has become the mainstream narrative. And what I like most about Bernie is his belief in the people, as opposed to corporations, being the beneficiaries of the wealth in our country. BERNIE SANDERS SUPPORTER: Like, he’s just for the people. He’s doing the right thing. BERNIE SANDERS SUPPORTER: I do not care the color of the person or the gender of the person that’s representing me, as long as they’re representing me, you know, to their best of their ability. BERNIE SANDERS SUPPORTER: He’s in it to win it this time. I think that’s a better thing. BERNIE SANDERS: Black and white, Latino, Asian American, Native American, gay and straight. Young and old. Men and women. Native born and immigrant. We are together. And together we will transform this country. NARRATOR: About his past and personal story, and about foreign policy and the military industrial complex. BERNIE SANDERS: Today we say to the military industrial complex that we will not continue to spend $700 billion a year on the military, more than the top ten nations combined. We’re going to invest in affordable housing. We’re going to invest in public education. And we’re going to invest in our crumbling infrastructure. No more major investments in neverending wars. NARRATOR: The people we spoke to were obviously here to support their candidate. But there was a surprising level of maturity about how Bernie could do better. It looks like when he says it’s not him, it’s his followers who are in the lead, he’s right. BERNIE SANDERS: No, no, no. It is not Bernie, it is you!